Property 28: 360 degree view over the Tuscan hills. Property 32: 360 degree view over the Tuscan hills. Property 36: A well kept apartment near Cortona. 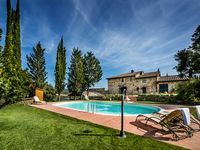 Property 49: Appartment situated in the vinyards with swimming pool and fish pond. We stayed 4 nights at La Fuga in March. The house and countryside are so beautiful and peaceful that they even got an over-programmed American family of 5 to slow down and breathe and enjoy. Communication and arrangements for our stay were handled expertly, Davide welcomed us warmly, and the Folonari family had everything set up for our comfort. Special thanks to Angela at the office for helping us with an extra request about sleeping arrangements. From Camigliano, we visited nearby towns and enjoyed excellent wine and food. Our children especially enjoyed downtime at the house where they could explore the roads and fields and make up games. The adults loved the quiet evenings, the ability to see the stars at night, and time to connect at meals around the kitchen table. We had to leave early to drive to Rome for our flight home, and Davide was kind to arrive and take care of the last details on our departure. We would recommend a stay here to anyone. We will remember our time at La Fuga fondly, and we hope we can return soon! As soon as we arrive, we are immersed in this ancient house, inhabited for a long time, by rich people. It is fabulous, the glories of the last centuries are revived, but I must say that they were good. A simply fabulous living room, a terrace without equal, a unique panorama. Thanks Alviero, for allowing us to experience a unique holiday.